Meghan Webster is having the worst day ever. It’s Christmas Eve, and she’s stuck on a bus, heading to a location she doesn’t want to go. That is, until the doors of the bus open and a cute woman in a pair of tight bicycle pants climbs aboard. For Rachel Lewis, a security guard at the mall, the holiday season is one big headache. She wants nothing to do with the celebration of love, peace, and family harmony. Her disenchantment with the holiday slowly begins to change when she meets seven-year-old Tyler and his mother. Rachel wants to propose to her girlfriend. To earn the money for the ring, she plans to take a second job as the mall Santa Claus. But luck is not on her side, so Rachel finds herself with bells on her toes, playing a Christmas Elf. For Annie, work always took precedence over romance. But now, recently come-out and involved in a relationship with a woman for the first time, she is determined to seduce her girlfriend, Drew, on Valentine’s Day. Unfortunately, she has no clue as to the arts of seduction. Kade’s homophobic mother is coming to Portland for a visit. Her timing couldn’t be worse. Not only is Kade newly in love with a woman, but she also promised to help her friends move in together. Instead of going to art museums, they will now help U-Haul a lesbian couple. Kade tries to tell herself it’s going to be a nice change of pace, but she knows better. Pop star Leontyne Blake is about to introduce her new songs to her fans. But is her relationship with small-town nurse Holly ready for her return to the stage? Lucia Sorrentino may come from a long line of chefs, but her attempts in the kitchen always turn into a recipe for disaster. Unfortunately, she’s just as untalented when it comes to her love life. She calls on her best friend, Remy, to help her wine and dine a woman. Will it become another cooking nightmare, or can she pull it off? At 30, Paula, a technician at a radio station, feels a bit ridiculous for having a crush on Dr. Christine Graham, host of a late-night radio show. Every night when midnight approaches, she vows that this will be the day when she asks Christine on a date—only to chicken out every time. But when Christine hosts a special show about revealing secret love on Valentine’s Day, Paula suddenly finds herself on The Midnight Couch. 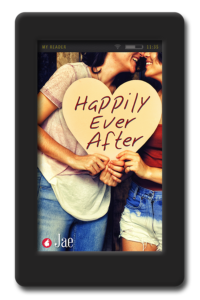 In true Jae’s fashion, her characters are loveable, interesting and always find a way to win a place in your heart in the few short pages of her stories. I don’t usually read short stories out of their original universe but I have to admit I really loved reading this book and getting lost again in those worlds I already knew a lot about and found myself wishing some stories where a whole book instead of just a few pages long. I recommend this to all of Jae’s readers, you will love it for sure, and to the others who don’t already know her work, it would be a great way to get a look into her universes and hopefully fall in love with them just as I have. What to expect from an already great writer? These short stories are just great, beautiful and let you even wish for more. Thanks to Jae there are already more stories including most of the characters. I really love her writing, it‘s nothing than exceptional! ‘Happily Ever After’ is a collection of short stories by Jae all in the one place. Some I have read before but it is nice to have them together. Also there are some stories with some of my favourite characters from Jae’s novels. I especially enjoyed ‘Dress Tease’ with Grace and Lauren from ‘Damage Control’. It was hot! The Christmas trilogy featuring Rachel and Lillian was lovely and well developed. I loved ‘The Midnight Couch’ where radio technician Paula is in love with Dr Christine Graham, clinical psychologist and radio host. It was sweet and happy . I’m a big fan of short story anthologies and reading this one made my day.